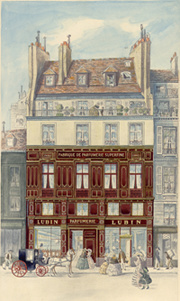 After the Revolution, Pierre François Lubin created his own Maison de Parfumerie in rue Sainte Anne, Paris: he used to supply notable gentlemen and the most admired ladies of the time with scented ribbons, ball masks, rice powder and the famous "Invigorating water" that will later turn into "Eau de Lubin". He quickly won favor with the French Imperial Court and Kings from all over Europe until in 1830 he conquered even the New World, being the first French perfumer to export to the USA and making his perfumes renowned all over the world. Nowadays these everlasting fragrances, rediscovered from the historical heritage, merge together with new scents of sophisticated and contemporary design and make a unique collection that Lubin only can boast. Mysterious fragrances celebrating far and exotic lands'nuances, revisited classical scents, captivating and modern jus all treasured in luxurious boxes, that celebrate these precious and unique pieces of art with the seal of the most historical brand of luxury perfumery. Discover Lubin's fragrances on www.lubin.eu!